Thousands of evangelical Christians from more than 80 countries descended upon Jerusalem this week to show their support for the Jewish state, including pilgrims and politicians from countries with a history of hostility toward Israel. The celebratory summit reflects evangelical Christianity's dramatic growth worldwide and gives a boost to Israel at a time when the country is increasingly isolated internationally. Attitudes in Israel toward evangelicals are evolving, from skepticism about Christian Zionist motives, to the realization that Israel cannot survive on the support of diaspora Jewish communities alone and is in no position to turn down the potential political and tourism boost the Christians can provide. "Israel has no better friends throughout the world," Israeli Prime Minister Benjamin Netanyahu said in a videotaped address that was beamed to a Jerusalem basketball stadium packed with cheering pilgrims Tuesday. The gatherers waved flags from home countries such as Angola, Brazil, China, Germany, Italy and the U.S. There was even a small delegation from Egypt, a country that shares a cold peace with Israel. Evangelical Christianity is one of the world's fastest growing religious movements. Of the world's estimated 2 billion Christians, some 700 million are evangelicals, according to the pro-Israel International Christian Embassy Jerusalem, which organized the Jerusalem summit. Evangelical movements are expanding most prominently in Latin America, Africa and Asia -- regions that "hold great potential for the nation of Israel in political, diplomatic and economic terms," according to a position paper the group presented last year to Israel's Foreign Ministry. The annual weeklong summit is billed as the Feast of Tabernacles, the Christian term for the weeklong Jewish holiday of Sukkot, which in biblical times was marked by a pilgrimage to the Temple in Jerusalem. This year's gathering included rock concert prayer rallies in which believers sang Hebrew songs and an annual flag-waving parade through the streets of Jerusalem. Evangelicals say their affinity for Israel stems from Christianity's Jewish roots and an anticipated Messianic age when all nations of the earth will flock to Jerusalem. Jews and Christians both believe in a future Messianic age, though Jews do not accept the Christian belief that Jesus is the Messiah. "Jesus is Jewish. He's coming again," said Marilyn Henretty, 77, of Annandale, Virginia, from the bleachers of one of the week's prayer rallies, clasping a tambourine and wearing a 12-gemstone ring representing the 12 tribes of Israel. "We believe it's going to be soon. All signs point to that." There has long been suspicion in Israel that the evangelical bear hug is connected to a belief that the modern Jewish state is a precursor to the apocalypse — when Jesus will return and Jews will either accept Christianity or die. Israel's Chief Rabbinate called on Jews to boycott an evangelical rally open to local Israelis this week, calling it "spiritually dangerous" and warning that evangelicals were trying to convert Jews to Christianity. In this photo taken Sept. 29, 2015, an Evangelical Christian holds Israeli flags during a gathering in Jerusalem. Israeli liberals are also uncomfortable with evangelicals because of their ties to America's political right and their support for Israel's settlement enterprise in the West Bank, a major sticking point in the Israeli-Palestinian conflict. Some evangelicals, particularly from the U.S., work as volunteers on Jewish settlements in the West Bank. But suspicions are diminishing in Israel, especially as evangelical groups funnel hefty donations to Israel and evangelical representatives in Israel downplay the apocalypse, saying it is not a central tenant of faith for most of the world's evangelicals — or what makes them love Israel. "We feel that their support is genuine and not deriving from any ulterior motive," said Akiva Tor of Israel's Foreign Ministry. Israel has long depended on diaspora Jewish communities to send donations and lobby their local governments on its behalf, but evangelical communities are becoming increasingly important bases of support. "The number of Jewish communities is limited," Tor said. "When there are large numbers of Christians who are interested in visiting Israel and understanding Israel -- that of course is very, very helpful toward improving our international standing." Evangelicals at the summit boasted of their success at lobbying on Israel's behalf in the halls of parliaments around the world. There are currently 32 pro-Israeli caucuses in parliaments worldwide, according to the Israel Allies Foundation, a Jewish-Christian pro-Israel political group that brought two dozen lawmakers from 18 countries to Jerusalem this week to meet with Israeli lawmakers and officials. The Israeli parliament's Christian Allies Caucus, formed in 2004 to forge ties between Israeli lawmakers and Christian leaders, officially relaunched this summer after a period of dormancy. International Christian Embassy Jerusalem director Jurgen Buhler called it a "miracle." At a prayer rally, Buhler introduced a group of 20 lawmakers from the Ivory Coast, which like most African nations broke ties with Israel in the 1970s but later restored them. The lawmakers flew to the Jerusalem summit on the Ivory Coast parliament's expense, Buhler said. The smiling lawmakers received a 12-ram's horn salute from a group of Taiwanese evangelicals blasting shofars, an ancient Jewish instrument. Also in attendance was the Rev. Mosy Madugba of Nigeria, head of a network of Christian ministers, who said his close ties to Nigerian leaders helped change the country's traditional pro-Palestinian stance at the U.N. In recent years, Nigeria has abstained from supporting U.N. resolutions supporting Palestinian statehood. Kenneth Meshoe, an evangelical South African lawmaker who heads the African Christian Democratic Party, said he has helped block anti-Israel motions in South Africa's parliament, including a recent effort to label Israeli products made in the West Bank as settlement products. His wife, Lydia, wore a bright yellow headdress and a Jewish Star of David necklace. Both said they hoped Jews would accept Jesus when the apocalypse comes. 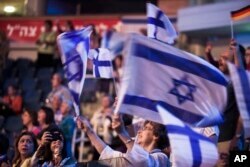 "God will bless those who bless Israel," he added.